October 3, 2010 - United Continental Holdings, Inc., formerly UAL Corporation, announced on Friday that a wholly owned subsidiary has merged with Continental Airlines, Inc., and that Continental Airlines and United Air Lines, Inc. are now wholly owned subsidiaries of United Continental Holdings, Inc., creating a world-class global airline. On Friday, the common stock of United Continental Holdings, Inc. begins trading on the New York Stock Exchange under the symbol UAL. 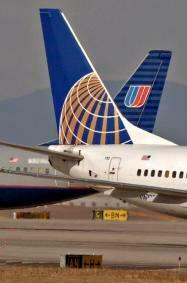 United Continental Holdings, Inc. also announced the members of its board of directors, effective Oct. 1, 2010. The 16-member board includes six independent directors from each of United and Continental, Glenn Tilton, who will serve as non-executive chairman of the board, and Jeff Smisek, who will serve as president and chief executive officer. The independent directors are Kirbyjon H. Caldwell, Carolyn Corvi, W. James Farrell, Jane C. Garvey, Walter Isaacson, Henry L. Meyer III, Oscar Munoz, James J. O'Connor, Laurence E. Simmons, David J. Vitale, John H. Walker and Charles A. Yamarone. Additionally, the board has two union directors: Stephen R. Canale and Captain Wendy J. Morse. "This is a true merger of equals, bringing together two strong companies and positioning us to succeed in a dynamic and highly competitive global aviation industry. This sets us on a path to create the world's leading airline from a position of strength, with one of the the industry's best cash positions, industry-leading revenues and a competitive cost structure," Tilton said. "Drawing from both companies, we have an excellent board of directors and a strong management team, and we have the industry's best people to deliver on the promise of great products and service for our customers, career opportunities for our people and consistent returns for our shareholders." "We are delighted to announce the successful completion of this merger. With great people, an unparalleled global network, the best new aircraft order book among U.S. network carriers and a commitment to superior products and services, United is well positioned for a bright future," Smisek said. "I look forward to working together with my co-workers around the globe as we begin our journey to create the world's leading airline that delivers best-in-class customer service, increased opportunities for employees, meaningful profitability and sustainable long-term value for our shareholders." With approximately $9 billion in unrestricted cash at closing, United expects the merger will deliver $1.0 billion to $1.2 billion in net annual synergies by 2013, including between $800 million and $900 million of incremental annual revenue, from expanded customer options resulting from the greater scope and scale of the network, fleet optimization and expanded service enabled by the broader network of the combined carrier. On a pro-forma basis, the combined company would have annual revenues of $31.4 billion, based on results for the 12 months ending June 30, 2010. Continental and United, operating under United Continental Holdings, Inc., will immediately begin the work to fully integrate the two companies. In the near term, customers can expect to interact with each carrier as they always have. Customers flying on Continental will continue to check in at continental?s website or at Continental kiosks and ticket counters, and to be assisted by Continental employees, and customers flying on United will continue to check in at their website or at United kiosks or ticket counters, and to be assisted by United employees. Customers will continue to earn and redeem frequent-flier miles through the respective loyalty programs of Continental and United until those programs are combined. The company expects that travelers will begin to see a more unified product in the spring of 2011, as the carriers integrate key customer service and marketing activities to deliver a more seamless product. "Today's merger closing is a big first step, and I want to thank my co-workers at Continental and United for their incredible efforts to get us to this point," Smisek said. "We have been moving quickly but thoughtfully on our integration planning, and I'm pleased with the progress we've made. We have a lot of hard work ahead as we begin to implement our integration plan, but our co-workers are enthusiastic about the opportunities this merger will bring to them." "Our outstanding team is the most important asset of the new airline," said Smisek. "We will be working together to provide our co-workers with the right culture, tools and incentives to do their jobs well and to make them proud to work for the new United." The new company's corporate and operational headquarters will be in Chicago, with a significant presence in Houston, the company's largest hub. As a result of the merger, Continental shareholders will receive 1.05 shares of United Continental Holdings, Inc. common stock for each share of Continental common stock previously held. UAL Corporation shareholders will now own approximately 55% of the equity of the holding company and former Continental shareholders will now own approximately 45%, including in-the-money convertible securities on an as-converted basis.